What do Spaghetti and Marshmallows Have to do with Autism? We woke up with the lark to prepare for today’s sibling and parents support groups. I translated some materials for today’s and the upcoming sessions, while the other members had fun doing some shopping and prepping the supplies we used today. 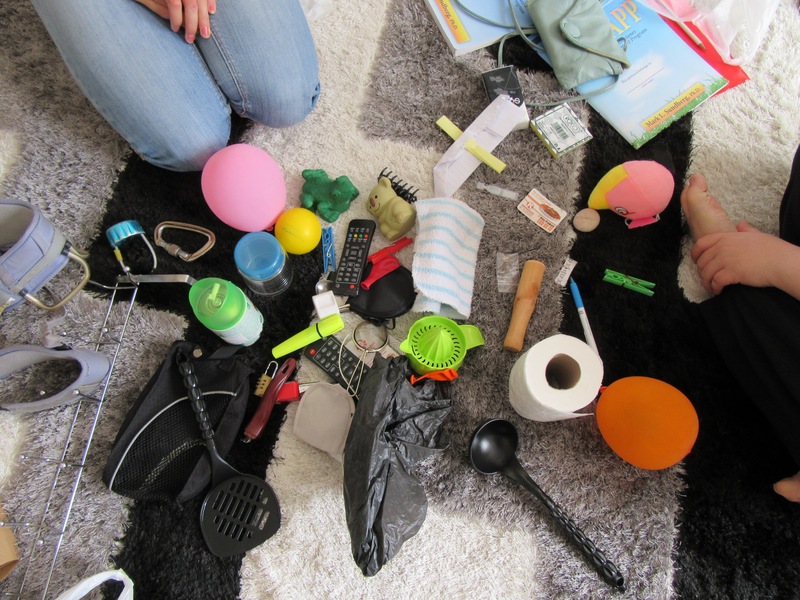 We also did a scavenger hunt at our apartment where we collected some random objects and laughed at ourselves as we were competing who can put their hands on the objects first. At 1:30, we headed to the center, half an hour earlier than our appointment, to organize the rooms, put chairs in pairs, and set up some of the materials that had to be arranged in advance. 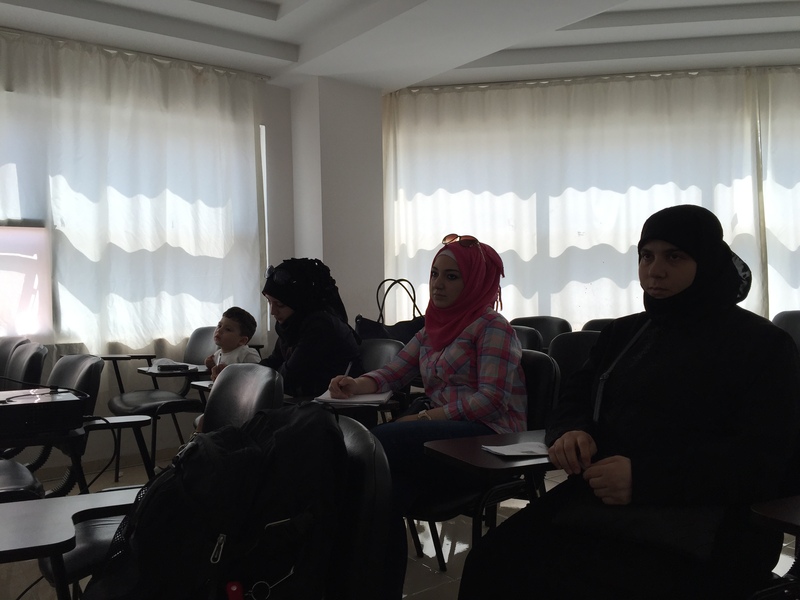 Then, parents and siblings started showing up (a bit late) to the support groups sessions. We started the sibling session with a warm up activity, where children were asked to say their names and one fun thing they did with their sibling with autism last week. One of the participants said with enthusiasm, “everything we did together was fun.” After we got everyone in the mood, we split the children into groups of two, where we asked them to pick small shell noodles with one hand in glove and the other hand behind their back. When siblings were asked to reflect on the activity, most of them agreed that it was hard, and frustrating at some instances. In order to further demonstrate how hard it is for children with autism to communicate their wants and needs, we asked the children to build the tallest tower possible from marshmallows and spaghetti with only one team member, we called the “leader”, speaking and giving directions to the other members. Kids really had an awesome time figuring out how to build the marshmallow-spaghetti tower and gorging themselves on the rest of the marshmallows afterwards. Masoud commented, “it was really hard communicating with my team without using any word. I wanted to tell them things I couldn’t communicate using signs.” Lina, 8 years old, added, “this activity was so much fun, but it was difficult for my team to listen to me when I tried to communicate using signs.” We wrapped up our activities for today with building-car-with-random-objects challenge. In this activity, speaking was prohibited for all members. One of the teams succeeded in building a car that runs by itself, while the other didn’t due to miscommunication. We ended the session with stressing on the importance of understanding that their siblings with autism find it difficult to communicate things typical children find simple and easy as well as asked them to bring a list 3 non-verbal ways their siblings with autism use to communicate. The same activities were simultaneously taking place in the other room with the parents. The surprising thing is that the marshmallow activity was the favorite for the parents as well. We were also amazed by some of the questions and remarks some parents had. For example, listening to Lama telling us, “After Functions of Behaviors training yesterday, I learnt to give Reema chips only after she finished her meal, so we shifted from two-hour meal flight into finishing a meal within five minutes,” filled us with joy. Others asked very meaningful questions like “Are TV and technology useful tools for teaching children with autism?”, “Does a child’s limited diet affect his development?”, and more. Today was a very intense day at the center and it was followed by some preparation for tomorrow’s community lecture and make-up training for teachers and parents who missed either of the previous ones. Our schedule for the next two weeks is going to be super crammed. Stay tuned to hear about some interesting stories from our trainings and sessions! We had an early start this morning as we had a packed schedule for the day ahead. Leaving our apartment coincided with a cleaner mopping the stairwells of the building. She was using so much water that we had to duck under waterfalls cascading between flights of stairs; The floor was very slippery and it’s a wonder that we only had one person fall over (for people reading this who know how clumsy I am- yes, it was me, Sarah). At the centre we were running our training session on “Why does my child do that?” This session was one of our more technical presentations and we looked at how we define behaviour, what the common functions (or reasons) of behaviour are, and strategies that we can use to teach appropriate alternative to challenging behaviour. We discussed the importance of changing things in the environment to teach appropriate skills and behaviour, rather than simply labelling a child as “badly behaved” and blaming the child for his/her behaviour. We used examples to illustrate our points and it was great to see parents reassured when we mentioned something that their child does too- one parent spoke to us about the possible reasons for her son throwing all of the crockery out of the kitchen cupboards, and another spoke about the possibly reasons that her daughter takes her clothes off in public places. 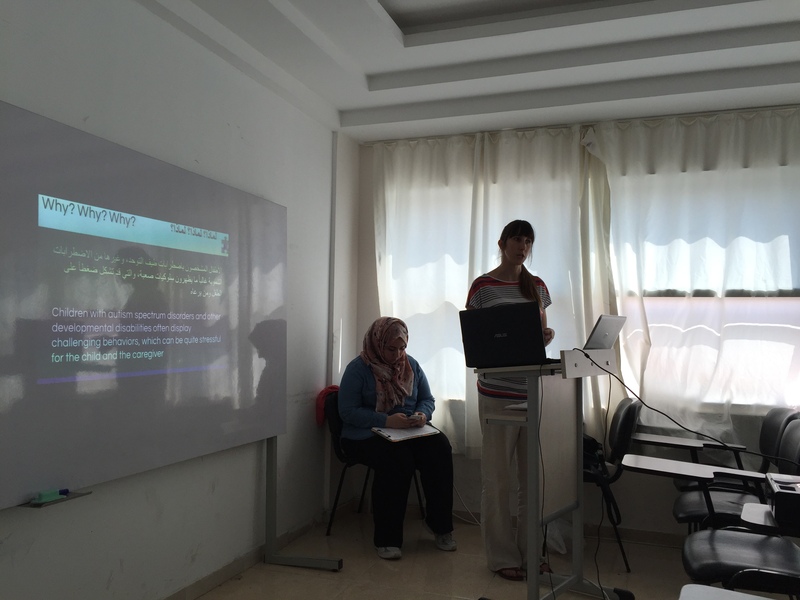 We ran the same session in the afternoon for teachers and parents who were not able to attend the morning slot. Presenters and translators were all feeling very tired by the end of the day and we had a very relaxed evening back at the apartment. Our first weekend in Mersin (our first weekend in Turkey was spent in Istanbul) gave us the time to relax and get ready for the busy week we have ahead. On Friday, after a full day of training, the team surprised me with a birthday celebration at the mall. We even went “ice” skating on an indoor rink made of plastic and wax. It felt nothing like skating on ice, but was very slippery. After a quiet, rainy morning on Saturday, we want for a walk along the beach. We went home to get some work done and then returned to the beach for sunset, where we met some nice Turkish people who pulled out Google Translate to have a conversation with us. It seems that our late night Turkish studies (We’ve mastered “How are you?”, “I miss you”, and “I love you” among other phrases) are starting to pay off. On Sunday, we returned to the beach to swim in the sea with our local partner’s children and then spent the evening at home translating, practicing and preparing for the week. We had a packed night before the week even started, but are sure that it will all pay off this week. 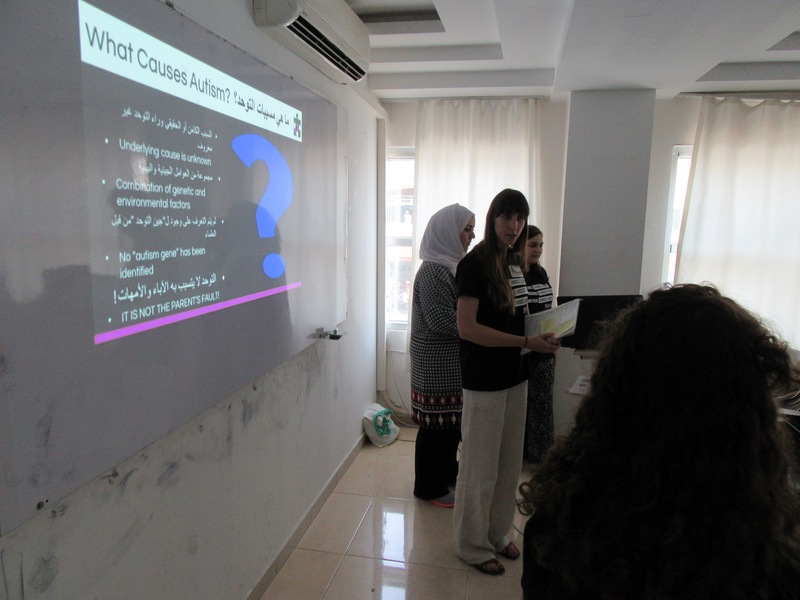 Today we ran our first training presentation for teachers and families and the topic was ‘What is autism?’ We covered areas including the characteristics and history of autism, how to get a diagnosis, and how intervention programmes can help children with autism learn skills and contribute to their societies. When we spoke about common myths in relation to causes and ‘cures’ there were some parents who believed that autism was caused by watching television, and that it was their fault that their child has autism. It was great to be able to clear up misconceptions in this area and reassure families that they have not caused their child to have autism. Part of today’s training involved an activity to illustrate how it may feel to have difficulties communicating or being understood. This is something that many children with autism have in common. The parents and teachers split into pairs and the ‘speaker’ in each pair was given a card with a message that they had to convey to their partner without speaking or writing. We had messages such as ‘Today I dropped my children at school, went home and cooked, and then went to sleep’, ‘I have been living in Mersin for six months and three days’ and ‘My children like to swim in the sea’. Everyone enjoyed this activity and reflected that as well as helping them to understand some of the difficulties experiences by people with autism. They also shared that it reminded them of trying to communicate within Turkey after arriving to live here without speaking the local language. The teachers and parents were very interested in today’s training and asked many great questions throughout. We are excited that they are so keen to learn and are looking forward to sharing more with them next week. Why Does My Sister Pull My Hair When She’s Angry? Today, after two days of meeting with teachers and families, we began our parent and sibling support groups and we couldn’t be happier with the results. The siblings, ages 6-17, came in ready to learn and share their experiences. After the siblings went around and shared fun facts about themselves based on the colors of the candies in the bags they received, we challenged them to line up according to their ages without speaking. One sibling, Hamudeh, quickly took up a leadership position and began organizing the others according to the number of fingers they were holding up. We then introduced the siblings to our unicorn mascot and asked them, “How many of you knew someone else who has a sibling with autism before today.” Not a single sibling raised their hands. Using the unicorn, we had siblings make statements about the things that their siblings with autism do. For example, Rawa said, “My sister with autism is very smart and has a good memory.” 7 others agreed with this statement and put their hands up and Rajeh caught the unicorn and said, “When my sibling with autism gets angry, he sometimes cries and breaks things.” Almost every hand in room went up in agreement. Every time we run this program, the siblings have more insightful questions than the parents, teachers or any other group! We look forward to answering their questions in the coming weeks. Today was another busy day with the families of children with autism and their teachers. After doing some translation and reviewing presentations at our apartment, we headed to the centre at 1:00pm, where another group of families was waiting for us. 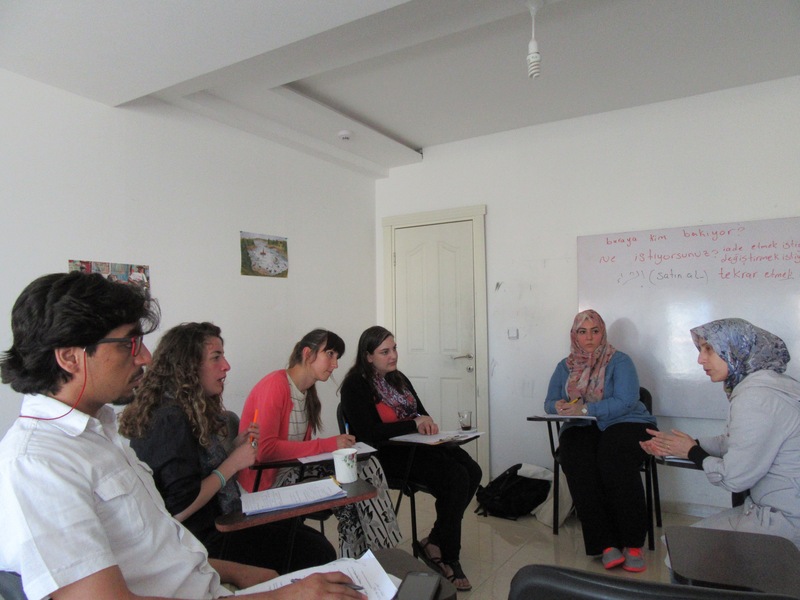 We split into two groups, each with a speaker of Arabic and an ABA specialist to meet with the families and carry on with what we’ve started yesterday. Parents were comfortable sharing their stories and the stories of their children as well as answering our questions and explaining to us why they are so excited to enroll in this program. There was this adorable 10 year old child named Yazan who approached us in a very friendly way and drew smiles on our faces. Also, some caregivers poured their hearts out while telling us about the special things their children do and how they imagine their future. 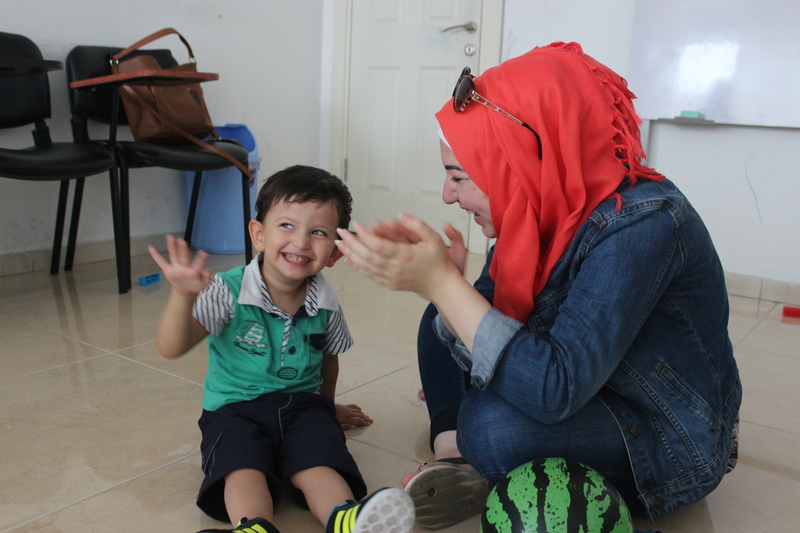 For instance, Omar’s mother said that her son is smart and kind and that’s why she hoped that he is going to become a successful and independent person who can contribute to this world in the future. At the same time, she expressed her concern about Omar’s aggressiveness while trying to hold back her tears by saying, “I want him to stop being aggressive with other people, especially his siblings who are always stressed when he’s around.” However, we were surprised that some of the families we met still believe that having a child with autism is their fault because they let them watch TV. This is probably is one of the challenging myths that we will do our best to clear out. At 3:00pm, teachers started to show up for our teacher intake meeting. It was awesome to see so many of them interested to meet with us and learn about our program and to see how motivated they are to help children with autism at their workplaces. After taking the teacher intake survey, we had the chance to get introduced to them and have one-on-one talks to in order to hear their reflections on the answers they provided in the survey and their motivation behind wanting to take our training. 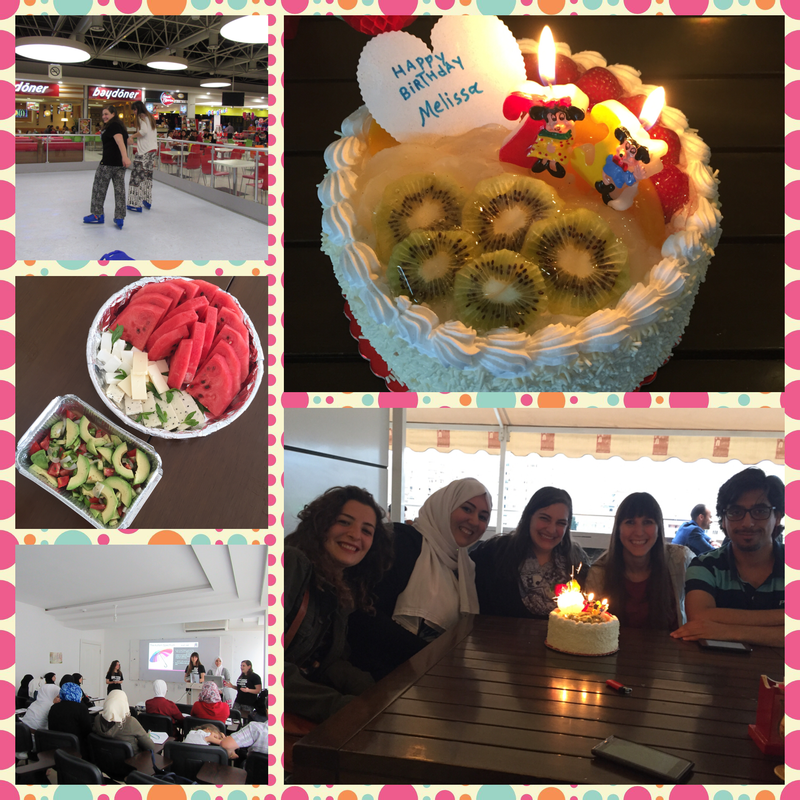 This day was one of the most hectic days for our Mersin team, so we decided to pamper ourselves with relaxation activities and a nutritious meal. Today we met the families and children that we will be working with for the first time. Over breakfast we looked over the questionnaires and measures that we were going to use with families in our parent interviews, and practiced translating these. When we arrived at the centre we were pleased to see that lots of parents and their children had arrived to meet with us. Most of the children had lots of energy and we had a very busy few hours meeting them, asking and answering questions. One girl called Rama made a particular impression on us when she kept taking and then giving back our pens as we were writing with them! Another highlight was meeting Hassan, a boy who drew us a very detailed picture of a specific travel agency in Mersin, complete with full address and phone number. In our initial meeting with each family we discussed their child’s skills and behaviour (for example, how they communicate and whether they engage in play with their peers or siblings). We also measured the levels of stress that parents are experiencing supporting their child with autism within the context of their culture and current situation living in Turkey. It was great to hear how keen the parents and caregivers are to be involved with the program, and hear stories, anecdotes and things that they enjoy doing with their child. We talked about goals and parent priorities that will help us to individualize our training for each child. This evening we have had dinner in our apartment, discussed the structure of the program and also had time to relax and reflect on the day ahead of another busy day tomorrow. On Saturday our team left Mersin to go on our surprise road trip. As our trip started very early in the morning, we had the chance to see breathtaking scenes along the way. We also passed through beautiful cities around Turkey like Ankara and drove past fascinating lakes like Tuz. Along the way, we excitedly tried many times to figure out our destination. We used some hints like the duration of the road trip and our current location on Google Maps along the way, but they were not enough at the beginning to come with a good guess! We had fun with our team building activities on the way. The first activity was about telling each other the different characteristics of two people we admire. The second part of this activity was discovering which of those characteristics matched what we aspire to be. The second activity was another page-turning story. Our story this time started to be about sea turtles then daisies and again, our favorite, unicorns! We had few stops along the way to buy some snacks, and we took some amazing photos together next to an incredibly huge mountain. When we started to get closer to our destination, the guessing game was on fire! Hana, Sarah and I were trying desperately to figure it out. Melissa finally confirmed our guesses and told us that our destination is ISTANBUL! I was, personally, super excited about it! We explored amazing touristic areas in Istanbul like Sultanahmet area and Al-Fatih area. We also visited Hagia Sofia, the Blue Mosque, the Grand Bazaar and Basilica cistern. 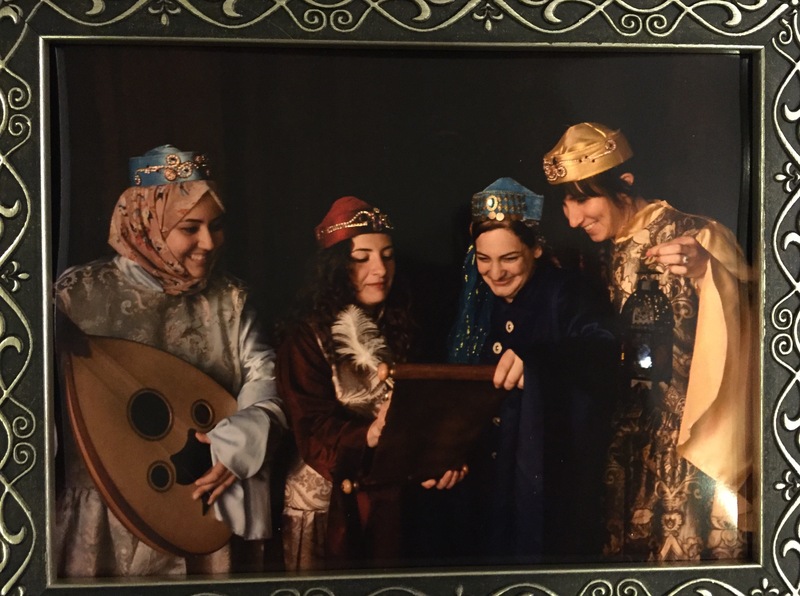 In Basilica cistern, we had the chance to take a picture together wearing fancy dresses like Ottoman princesses, which was one of the most beautiful memories we made on this trip. During our exploration, we were walking on foot most of the time, which made our experience even more enjoyable. The next morning before we headed back to Mersin, our team met with an international NGO in Istanbul to explore possible collaboration opportunities with A Global Voice for Autism. The opportunities look promising…stay tuned! 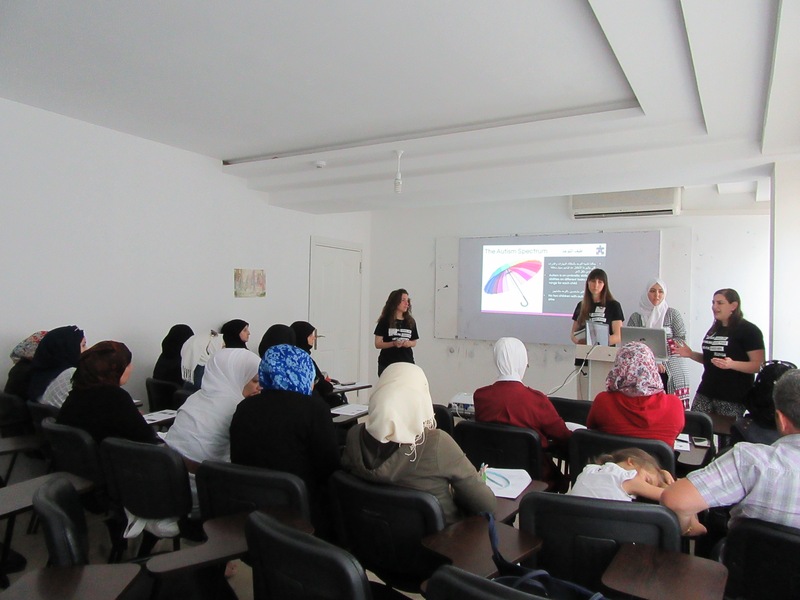 In the afternoon, we drove back to Mersin with great enthusiasm for the next day, which was the first day of the program to meet parents and teachers in the school. Although we arrived home at 4 in the morning, we were anxious to wake up a few hours later to meet with the families. Unicorns, Prototypes and Deeps Dives…Oh My! We had a full day of orientation activities today in preparation for our Surprise Road Trip tomorrow. Our first activities channeled our creativity. As a team, we came up with a page-turning story about trees that climbed buildings to eat bananas in pajamas with dancing monkeys. (Coming soon to a store near you!) We then discovered the “unicorns on our heads” as we took on the challenge of telling an improvised story for 5 minutes without stopping. After learning about our unicorns, we practiced “design thinking,” an innovation process developed at Stanford University that allows us to identify customer needs and rapidly prototype solutions. Our task was to revolutionize international travel by designing a product that met our partner’s travel needs. At our “investor fair,” a virtual reality hotel touring glasses, an app to ease airport security, a robot helper and an endlessly flying airplane were among the revolutionary solutions for tomorrow’s travel. In the afternoon, we headed to the beach to do a diversity walk. The activity was a heavy one and we appreciated some silent reflection time on the beach before discussing the experience. After picking up a few things for our apartment, we returned home for a homemade dinner of stuffed grape leaves. We spent the evening doing deep dives, where every team member had the opportunity to share the story of how they ended up here (in their lives and on our team today). We are now finishing the packing for tomorrow. In the morning, we will be leaving at 5a.m. for an approximately 10 hour team road trip to a surprise destination. The trip will wrap up our orientation so that we can start our teacher training and family support programs as soon as we return. Can you guess where we are going? Our team kickstarted its first day in Mersin with an orientation session, where each member of the team briefly introduced themselves and got to know each other better. Next, with our lovely Syrian volunteers, Samer and Naji, we paid a visit to the center where we are going to conduct our meetings with Syrian children with autism, their parents, teachers and siblings as well as our public awareness lectures that target the public in Mersin. The directors of the center were very collaborative and they offered to show us around the center and the adjacent school to see how we can make the utmost use of the rooms to serve the goals of our training and activities. The center is well-equipped and has many facilities like a medical center, classrooms, lecture halls, and projectors that constitute a perfect space for carrying out our program. 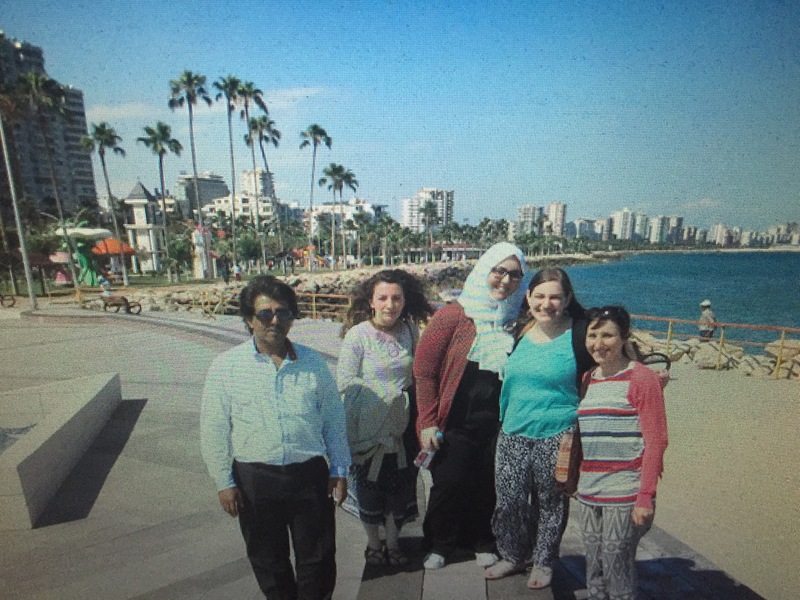 After this energetic step and warm reception from our partner organization, we headed to the Mediterranean Sea and the old city of Mersin to do some sightseeing and explore its cultural and social aspects. As a treat for this busy day, we had Turkish tea at one of the traditional cafes in the streets of Mersin. We went to our beautiful apartment in the afternoon to rest and have a healthy and delicious lunch that was prepared by our amazing Syrian cook, who fascinated us with her generosity as the amount of food cooked would serve 10 people and as the variety of choices was overwhelming. We ended this awesome day with another orientation session to deepen our knowledge of each other and to warm up for our team training in the next five days. We poured our hearts during this session, shared personal stories, and had much fun and laughter. Follow our blog to keep updated with our activities, the progress of our program, interesting stories, and more!